Teenage drivers are often viewed with suspicion. There’s a general perception that young drivers are almost always susceptible to distraction and irresponsible behavior behind the wheel, since inexperience as a motorist can lead to making mistakes. One of our firm’s articles takes a look into the issues surrounding young drivers today. We discuss the prevalence of texting and driving among teenagers, which is certainly a major concern. A National Safety Council survey cited in the article notes that 31 percent of young drivers included in the study admitted sending text messages behind the wheel, despite the fact that most understand it’s a dangerous activity. Although there may be some truth to the perception that teenagers aren’t always the safest drivers on the road, they aren’t the only group of people who engage in negligent behavior. Many older people might own mobile devices and use them behind the wheel too. No matter the age of the driver, becoming unnecessarily distracted by a text message is still dangerous. Florida lawmakers passed a law in 2013 that makes it illegal to text and drive. Under this law, a driver can face a traffic violation and subsequent fine. One thing to note, however, is that this is a secondary offense, so a ticket can only be issued if a driver is being pulled over for another traffic violation. Regardless of the state’s texting-and-driving ban, motorists still have a duty to operate their vehicles with caution and care. Using a mobile device while driving runs contrary to this responsibility and can be considered negligence. 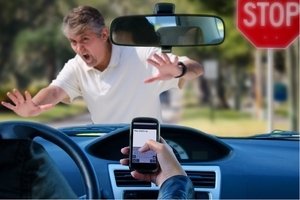 As a result, distracted driving can serve as the basis for a personal injury claim in the wake of an accident.